So I started and stopped about five or six posts last summer, and for whatever reason, never got around to finishing them off. Anyhow, this is just one such posting. 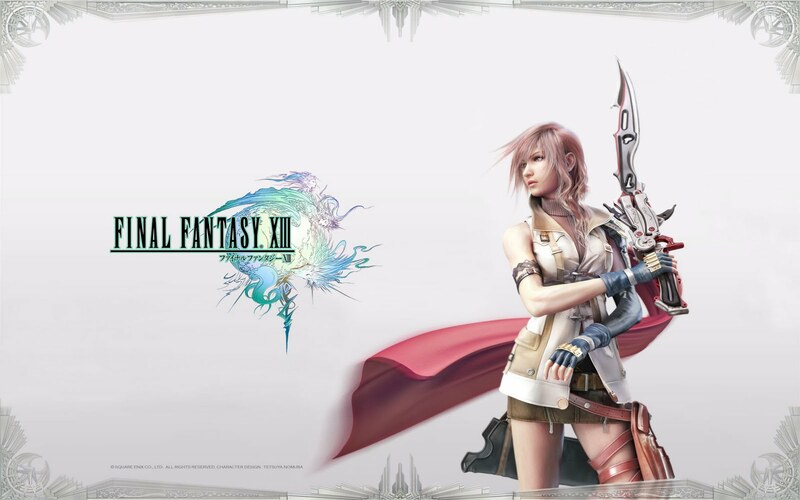 Final Fantasy XIII is one of the most highly anticipated titles originating from Japan this past year. The release was met with some criticism for its linearity but on an overall basis, it fell on the positive side of reviews. Even though Final Fantasy is my favourite series of games, I came out of this game liking it, but not loving it. I guess that puts me into the majority of people who have played this game. 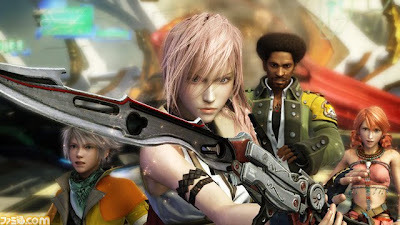 The story follows a character named Lightning who was a former soldier of a government organization called Sanctum, as part of the floating city called Cocoon. The soldiers are branded with the task of suppressing people labeled as Pulse l’Cie, who are people infected with magic after coming in contact with the land called Pulse, the world below. The Pulse l’Cie are feared because of their control from god-like beings called Fal’Cie. The l’Cie are each given a catch-22 sort of mission. If they complete the mission, they will turn into a crystal-like statue, if not, they will turn into a monster. Lightning and her rag-tag band of heroes become infected after a skirmish and together, go on a journey to discover whether they can avoid the ultimatums inherited when becoming a l’Cie. Get it? I enjoyed the action heavy combat system, sort of like a hybrid of Final Fantasy X and XII. You can see the enemies on the field before engaging in a battle, but when engaged, you transition into a newish field where you do battle. The battles themselves are fast paced, giving you only control of your main character while the computer controls your other two partners. Your control over your character during fights is akin to an MMORPG, in that you can issue it general sort of tasks (auto-battle) or you can manually select the abilities. The abilities you have available are then dependent on the roles that your characters play. There are a variety, such as Commando (similar to a straight up fighter), Ravager (which focuses on offensive magic), Medic (who specializes in healing abilities) and so forth. What makes it strategic is that you can’t change the roles of the characters on an individual basis. Rather, you are allowed to switch between sets of roles amongst your characters (which they dub ‘Paradigm Shifts’), through a limited number of customizable slots. Because the slots are limited, it becomes a balancing act of refining what role sets are best used for the current situation. For boss fights, loss is inevitable, and often requires tweaking of the role sets. The game is visually stunning, taking you across a wide array of terrain and landscapes, both natural and techno-futuristic-y. It’s not until you hit an area called Gran Pulse that you’re allowed to free-roam and explore the vastness of their world. Gran Pulse itself is breath-taking, almost like a savanna in Africa, filled with all sorts of creatures both big (REALLY BIG) and small. Now this is what bogged down my experience with the game: the story. There was a lot of criticism for the linearity of the game. More specifically, a good portion of the game consists of running down a straight corridor, fighting some sort of boss character and going to a cutscene… if you think about it, it’s similar to the structure of the first Super Mario Bros., Level 1-4. But I don’t agree with this particular criticism. I understand where the Japanese game designers are coming from. They want to tell a certain and specific story and want to bring the player through a certain experience. The problem I have is with the story itself. The first problem is that they sort of throw you into the middle of the story from the get go. They throw all this verbage and lingo at you without clearly explaining what they’re talking about, which makes for a confusing start. It’s only after a few hours of play that I finally understood what the characters were talking about. It’s not the ramp-up experience that we’re typically used to, it’s more “GO GO GO!!!~!@~!”. The story itself did not seem as intriguing as the stories of past entries in the series. I think this was hindered by the stoic female lead, who I think would have been a more interesting side character than as a main character. There’s something that keeps the character from being relative when there’s not that emotional connection. The same can be said of most of the characters. The characters lack character. It sort of reminds me of the type of main characters you’d typically find in Japanese anime. I guess that ‘dry’ kind of attitude is supposed to be ‘cool’. Probably my favourite character was the black character named Sazh. I thought that everything they designed with him was amazing, including the voice work which was fitting. Plus his son in the game is probably one of the cutest characters I’ve seen in a video game. He’s like a mini Marshmellow Man from Ghostbusters. Technically and mechanically, the game was impressive and a work of art. It had all the nuts and bolts that are needed to make a great game, yet it was missing some that cohesive element to really hook you in and give you a reason to press on. So while on the whole, I enjoyed my experience with the game, I wish there was something more. It’s one of those games where when I finished it, I decided that I would probably not play it again. And it’s disappointing that I have to say that about a Final Fantasy title. You can find the game for cheap nowadays, and I think it merits a single playthrough at the very least, especially if you’re a fan of Japanese RPG’s. Until next time, later geeks!